Unless you looked away from the of credits of almost every Transformers cartoon over the last few years, then the name "Jeff Kline" should sound familiar to you! He's served as the Executive Producer of every season of Transformers Prime, the series finale movie "Predacons Rising," Rescue Bots (Season 1), and the forthcoming Robots in Disguise! Robots in Disguise season 1 will consist of 26 episodes. Writing, recording and story boarding for Season 2 has already begun!. Next, in part 2, we'll talk much more about what's to come, to be published later this week. Stay tuned! Kline: WE DECIDED VERY EARLY ON THAT WE ALL WANTED TO SEND A MESSAGE TO THE AUDIENCE THAT THIS TRANSFORMERS SERIES (PRIME) WAS GOING TO HAVE REAL STAKES… REAL CONSEQUENCES… AND THAT NO ONE WAS SAFE. And yet, they only proved that true for Vehicons, Insecticons, minor Decepticons, and just three major Decepticons (one of whom even got his death undone). Anytime an Autobot who wasn't Cliffjumper wrestled with death, they got better. Meh. Also wondering if maybe in season 2 Megatron or Galvatron show up with some more of the cons we are classically used to or if it will stay in form where the beast cons are the only guys on the bad side. Maybe RID has something more to do with the deadlock thing in Prime towards the end of season 3 where we are shown multiple Cybertrons and the bots of TF: Prime only know about one of them, aside from possibly Shockwave and Soundwave who appear to be trapped in an alternate dimension. Enough banter though, can't wait for the second part with more RID stuff! Since the show's already been airing in Chinese, reports from viewers who watched the episodes early reveal that Optimus is still deceased. 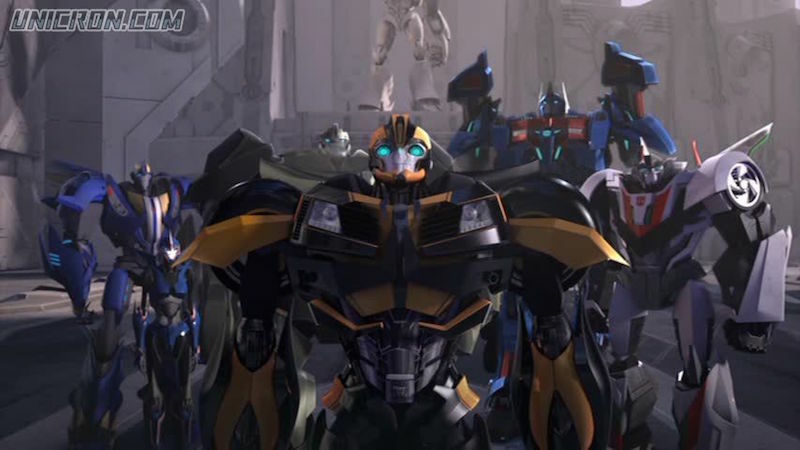 The scene in which he assists Bumblebee's team against Underbite and gives them their instructions is a temporary occurrence of Optimus manifesting into the physical world, sort of like the opposite of astral projection. Once he's completed giving Bumblebee's team their instructions, his brief time in the world of the living ends, returning him back to the afterlife. For what it's worth, please note that these questions were submitted quite a few months ago. - Before the name of the new series "Robots in Disguise" had been announced or unveiled, and I just got the responses back a week or two ago. Though not the newest of info, I found it all an interesting read. Hope you all did too!